Responses made me laugh out loud. Then I started thinking–Was it just back in the day when gasoline was c-h-e-a-p that kids did that kind of thing? Was it just Small Town Worlds? Just Oklahoma? Around here, though, kids liked to pile in a car and ride around, but only certain streets. 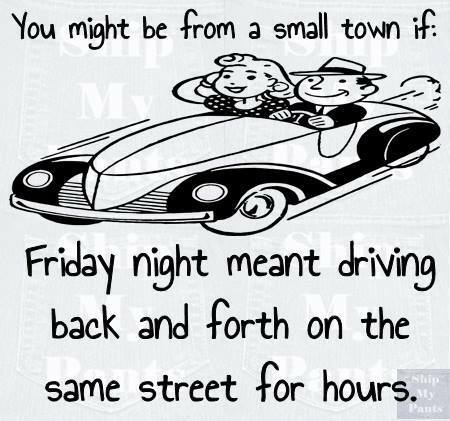 They’d drive down main street through town, turn on the other main street, drive to the end, circle the fast food restaurant there and head back the way they came. I’m not sure where they turned around on the north end of town. Anybody? And you didn’t just drive. You had to honk at your friends in other cars when you passed them. The reason we did it wasn’t about driving or riding, you know ? Okay, I didn’t do it. (Honest, Dad!) But everybody else did. I was sure then and I’m positive now. Every single person in this Small Town World got to drag main except me! It was a social thing. It was about hanging with friends and making new friends. Flirting with boys (or girls). Having fun. And sometimes, the cars stopped and the occupants mixed up and started Dragging Main again. Of course, after the mixing, sometimes kids rode together who shouldn’t have been together, and then watch out for the drama! But hey, at that age, life is all about the drama. Right? Now the Terminally Curious in me is asking, Has it ended? Did Dragging Main go the way of cheap gas? If it ended, what took it’s place? One more question: Did you Drag Main? And if you did, did your mama know? I come from a small country town and it was normal for the teenagers to cruse the square. Yes our small town had a town square and that was where you would find them, going around the square. Of course I did it too. However, my mother gave us (my sister and I) a curfew so we had to be home by midnight. Unfortunately, my sister who was 14 months older was always making us late because she loved to talk. So we would have to come up with an excuse as to why we were late. I bet we were the only kids that had to be home at a certain time. I hated it because things were just getting started around midnight and we would be headed home. I don’t believe they are allowed to cruse the square any more but back in the late seventies through the eighties I know they did. No, I never drag raced. I didn’t start driving fast until the late nineties when I started working in Kansas City Missouri. What a great memory, Lady! I’ve seen towns with town squares, and I’m envious! I wasn’t talking about driving fast or racing. We called cruising main street “Dragging Main.” The only fast driving I remember was guys (and a few girls) ran the quarter on the bridge north of town. What state did you grow up in?